Salem Haunted Houses are some of the scariest and best in America! Hauntworld.com rates and review the best and Scariest haunted houses, haunted attractions, and Halloween events in America! Hysteria at Connors Farm is located in Salem, Massachusets just minutes from Boston and is one of the scariest haunted houses in America! Prepare to scream! Sit back and prepare to scream through our review of Hysteria at Connors Farm. This Halloween you can't miss the scariest and best haunted attraction in the entire state of Massachusets, Hysteria at Connors Farm. Their attraction features some of the scariest actors, crazies scenes, and amazing set design. Now sit back and read all about the best haunted house in Massachusets, Hysteria at Connors Farm If you are looking for one of the best haunted houses in Boston Mass or Salem Mass look no further as Hysteria is located right between he two area's. Massachusets features the town of Salem which is an entire Halloween themed tourist town with Witch Musuems, Halloween themed events and much more. Each October visit the Salem area and make sure to tour Hysteria Screampark with five different haunted attractions. Now read our entire review. It’s a crisp October night. The moonlight pierces the low hanging fog that clings to the cornstalks at Connors Farm in Salem, Mass. Cold October nights have created this same eerie feeling every year since settlers first planted the fields on this farm in the mid 1600s. Located in the Halloween capital of the world, Hysteria is the newest rising star among America’s haunted attractions. In 1692, Danvers was known as Salem Village, the center of the infamous Salem Witch Trials. Although the town fathers changed the name to escape controversy, the events that transpired on these grounds are forever etched into the historical records. Many believe that to this day, a curse still hovers over a remote area of Danvers known as Connors Farm. This sets the stage for Hysteria. Hysteria’s mission is to help their guests create positive memories that impact them long after they leave the attraction. This mission shapes the overall haunt philosophy and culture at Team Hysteria. There are many moving parts within the haunt and every facet must come together in order to deliver a first-rate performance each and every night. 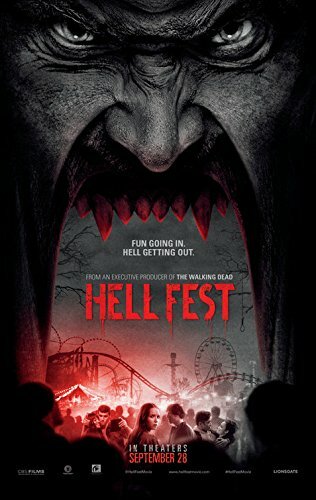 A focus on high caliber acting, quality costumes, strong themes and detailed sets create a realistic, haunted experience for guests that is sure to keep them coming back year after year. With over 50 acres of entertainment, Hysteria has something for everyone. 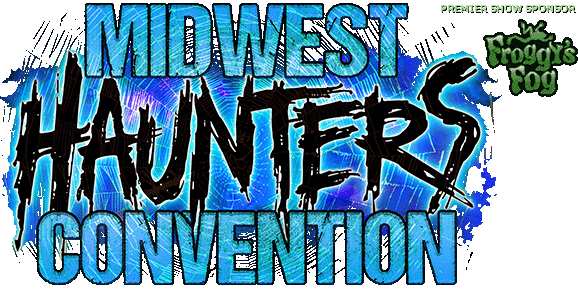 The venue consists of 5 main haunted attractions with varying levels of intensity. Guests can enjoy the family friendly Maze of Darkness, a walking tour through Hysteria’s historic “Burial Grounds” or immerse themselves in the extreme terror and over the top gore in The Fields attraction. Visitors can shoot zombies at Hysteria’s signature Zombie Hunt at Connors Compound or squeal and squirm at the sights and sounds of Madame Abattage’s Cirque du Dement travelling circus and sideshow. Hysteria’s management team is responsible for making sure every component of the haunt operates smoothly. Brothers Bob and Pat Connors are co-owners of Connors Farm and together, they ensure each haunted house has a high overall production quality. As heads of the leadership team, the Connors know it’s important to surround themselves with loyal, dedicated, enthusiastic people. The core management team is comprised of JC Fox, Operations Manager, as well as Creative Managers, Benjamin Selecky and Alexis Abare. From brainstorming to problem solving, the haunt team works together to make sure all decisions are well thought out and continue to move the haunt towards the common goal: to help their guests form lasting memories by providing them with a first-rate haunted experience. A frantic 911 call from a lost family at Connors Farm created a media frenzy. It catapulted the popularity of their haunted attraction and jump started the evolution of Hysteria into THE premiere Halloween destination in Massachusetts. Each fall, the Connors Family Farm turns part of their property into a themed maze where visitors come to “get lost.” Connors Farm has been involved in the Agritainment industry for several years. They expanded their daytime operations to include numerous family activities as well as pick your own apples and pumpkins. Their fully stocked farmstand and country kitchen, with famous hot apple cider & donuts, compliment the overall business and draw numerous crowds each season. In 2011, inside the Salem Village themed maze, a family had to be rescued by local authorities after literally getting lost in the field as darkness fell. The story received international attention from media in Ireland, England and Australia and domestic news outlets such as The New York Times, the Los Angeles Times, and Associated Press. Television hosts Jay Leno and Chelsea Handler also joined in the fun and Saturday Night Live writers included the incident as part of their Weekend Update segment. This incident was explosive for business. Many guests flocked to the farm to see the newly termed “911 Maze” and haunted cornfield. Everyone wanted to visit the Massachusetts farm and haunted event that was generating all the media buzz on radio, newspaper and television. The incident was plastered on the front page of countless local and Boston area newspapers. Was the cornfield really haunted that night? Did the darkness swallow the family whole? Bob was bombarded by phone calls from news organizations coast to coast. The day following the incident, he was interviewed by 12 different radio shows. Good Morning America even wanted to fly him to New York City to talk about what happened LIVE. This incident created a buzz in the Halloween maze industry that has not been duplicated to this day. Connors Farm is a proud member of The Maize Company, founded in 1996 by Brett and Nicole Herbst. The Utah based organization is the world’s largest corn maze company. Since its inception, membership has grown to include over 260 mazes throughout the United States, Canada, Poland, and the United Kingdom. After the explosion in attendance stemming from the 911 incident, Bob had the financial ability to dedicate more resources to improving the haunted house. The acreage used for the haunt was expanded. The staff added sets and upgraded props to improve the overall horror experience. A local company was brought in to handle lighting and sound. New England Event Producers, based in South Hamilton, is owned and operated by 2 young entrepreneurs. Each year, their crew handles the power distribution needs for the haunt. Since Bob brought them on board, the quality of lighting, sound and fog has steadily improved. Being able to control these special effects in an outdoor environment is challenging due to the unpredictability of New England’s weather. The crew does a great job of managing these elements and maintaining a quality product each night throughout the Halloween haunted house season. A strong emphasis was put on building a team of quality actors. The leadership team pays particular attention to the interests and talents of the actors and takes every opportunity to foster creativity. All of the people currently involved in makeup, props, costuming and sets have developed from within. Cultivating these functions in-house has created a sense of pride and ownership within the staff and has allowed team members’ talents to flourish. This approach has taken the overall production quality of the haunted house to a new level. 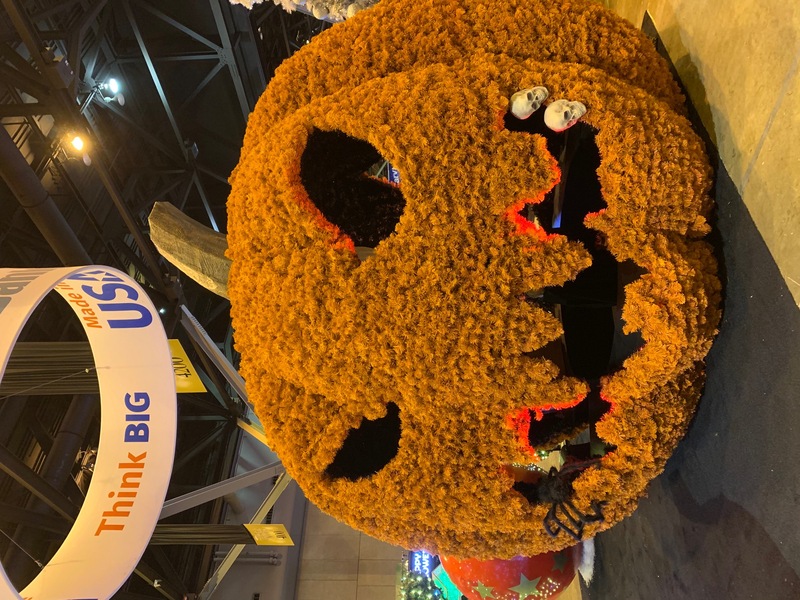 Hysteria’s core team has attended the annual Transworld Halloween & Attractions Show for the past 2 years. The industry tradeshow has been instrumental in driving the constant improvement of the haunt and has been a great learning experience. 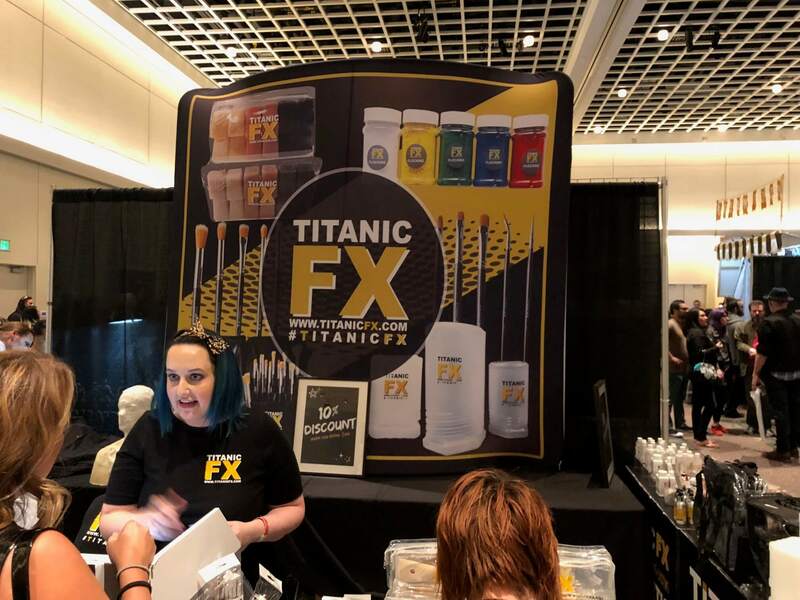 Sharing the industry’s best practices as well as staying updated on new developments and keeping up with the latest trends has kept their attractions fresh for their customers each year. While at the show, Hysteria’s team also networked with key players in the industry and took every opportunity to learn from their success. The team at Hysteria firmly believes they can learn something from every player in the industry. “If you stop learning, you stop evolving,” says Connors. “Hysteria is not just a haunted venue; it’s a state of mind,” says Connor. 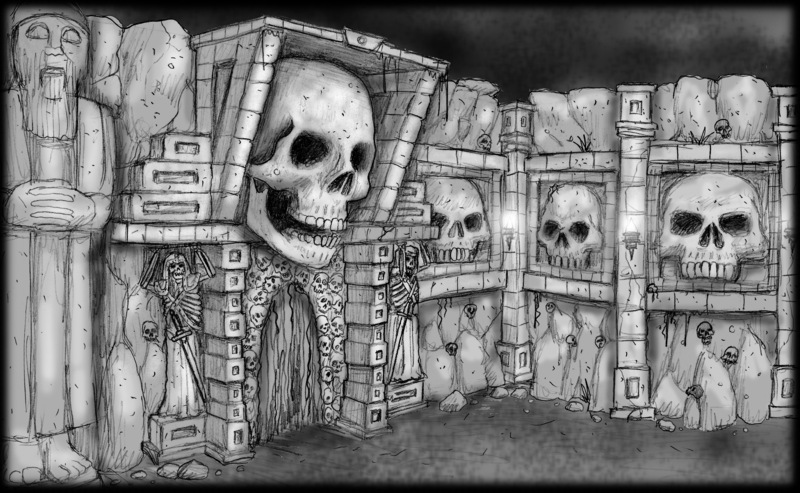 The entire philosophy of the haunt is being reinvented for the 2014 season. Having a great experience starts from the moment guests enter their property. Every aspect of the haunt must work together to contribute to an overall positive trip to this Scream Park, and it starts from their very first encounter in the parking lot. Unlike many other haunts in the area, Hysteria does not charge their customers for parking. When guests arrive at Hysteria, they are welcomed by the host: Cerberus, The Soul Keeper. The Keeper is the watcher over the farm, and absorbs the souls of the people that are sacrificed in the fields. He is Hysteria’s version of the Grim Reaper. Cerberus is outfitted with a handcrafted burlap mask and tophat from the Grim Stitch Factory. 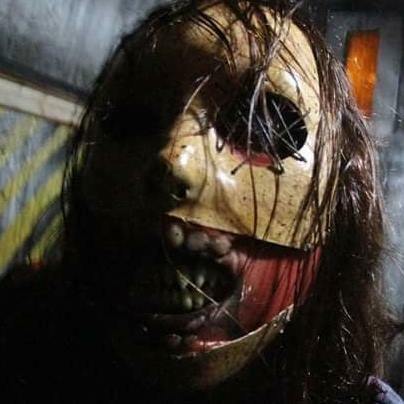 The quality construction, stitching and painting of the mask sets The Keeper apart from scarecrows seen at other haunts. Once at the main entrance of Hysteria, guests have several choices for which attraction to visit first. They can have their photos taken with their choice of several queue line actors. Icon characters entertaining the crowd are wearing full body costume suits made by Global Fear Enterprises. Each of the costumes are highly stylized suits with extraordinary detail from head to toe. All of these characters will no doubt be posted all over social media as guests snap photos. Under the umbrella of Hysteria, there are presently 5 main attractions: Zombie Paintball at Connors Compound, The Fields, Cirque du Dement, The Burial Grounds and the Maze of Darkness. 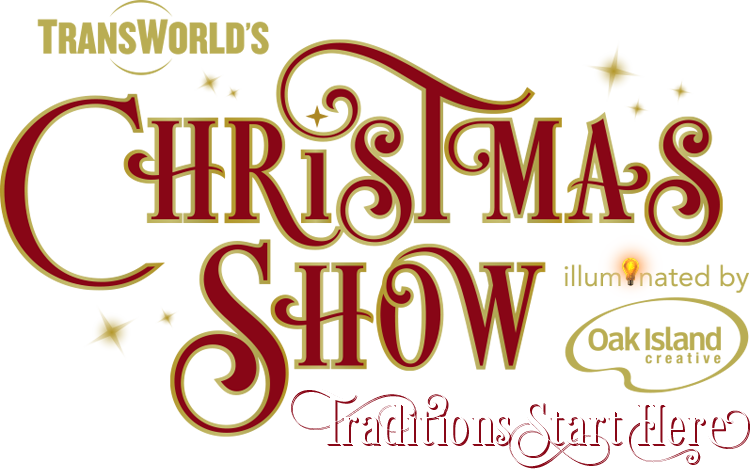 In addition to these main attractions, there is plenty of queue line entertainment, concessions and other activities for guests to enjoy. Free mechanical bull rides keep people wildly entertained while they wait in line enjoying barbeque concessions fresh from the grill. They also serve popcorn, kettle corn, cotton candy, hand dipped caramel apples, homemade fudge, and hot apple cider with fresh donuts. Inside the safety of The Compound, a stage overlooks the eerie pond and glowing bonfires. Local bands and other live entertainment keep guests engaged while they wait to hunt the undead. Visitors are encountered by several zombies on the loose as well as the farmer’s daughter, who lives inside The Compound despite her infection. When guests return from the hunt, they have an opportunity to get their photo taken with a zombie. Once they leave The Compound, guests head across the street to see the 3 remaining attractions. The Maze of Darkness is a 7-acre corn maze with a different theme each year and is fun for all ages. Visitors can access clues to help them find their way. Some guests choose to navigate the field only with the aid of the moonlight, while others flock to the safety flashlights. Although there are no actors inside this maze, the haunted field alone is enough to scare most. Each time the wind blows, the sound of the corn stalks rustling keeps guests looking over their shoulders. Guests can complete the corn maze at their own pace, and the complexity changes every year. After the Maze of Darkness, the first haunted attraction to encounter is The Fields. The Holt Brothers and their extended, inbred, twisted family live there on the farm. Each October, the family performs an annual “Ritual of the Fields” where visitors become victims and are sacrificed to their god. Visitors follow a path cut through the cornfield and get a glimpse of the Holt Brothers’ childhood. Next, they trek through a wooded area bordered by an ominous swamp where members of the Holt family live and hunt for their next victims. The real smells and sounds of this natural setting are unmatched by any indoor attraction. Guests also get a glimpse inside a few of the shacks and cabins where twisted members of the family live. The next stop is the Holt family home. Soon to be victims get a full tour through the filth and horrific sights inside the dilapidated cabin. The trip through the cabin would not be complete without descending into Stanley’s basement workshop. Here, guests encounter a frightening man wearing a mask made of skin. Stanley is an imposing, ominous figure that enjoys skinning his victims and using their skin, hair and teeth to construct gruesome clothes and masks. If guests are lucky enough to escape Stanley’s dungeon, they find themselves in the middle of the annual Ritual of the Fields, where guests become the ultimate sacrifice. The creative team does a great job of using all the senses to completely engross guests in the haunting experience. Every element of the haunt supports the storyline and creates a believable environment for guests. They also do a fantastic job of using main and supporting characters to develop the theme and achieve a realistic experience. The same level of realism they accomplish in The Fields carries over into the final haunted attraction, the Cirque du Dement. The costumes, sets and characters create an immersive experience that places patrons inside a vintage traveling circus and sideshow. The host of the show is Madame Abattage. Madame is a bombshell exprostitute that inherited the business when one of her “Johns” died under mysterious circumstances. She is now the woman on top and she rules with an iron fist. Her right-hand hound, Star (a squirly carnie), does her bidding for her with the point of a finger and swiftly administers punishment to underperformers. Guests enter the attraction through a Vortex tunnel and once on the other side, it is like a whole new world. The props and sets create a genuine vintage feel, and it’s almost as if traveling back in time. Once inside the big top, the Ringmaster sets the tone for what the guests are about to experience. Each set has a demented twist that is sure to turn stomachs and make people squirm. Smells and sounds help create the scenes throughout this haunted attraction. A mix of backstage and under-the-tent sets help to create the feeling of a full tour through this Cirque. In addition, the Cirque also uses specialty acts to entertain and dazzle. A skinned woman works a lira which is a hooped trapeze act that can’t help but draw attention, and a rotating mix of other acts include tumblers, contortionists and fire breathers. The team at Hysteria always done a great job creating an atmosphere that is consistent throughout. Every element comes together nicely in order to put the customer into the scene, resulting in an overall convincing experience. After exiting the Cirque, visitors travel through a Midway with photo opportunities, food and various concessions. Hysteria at Connors Farm is also the site of a unique historic attraction: 17th Century Burial Grounds. 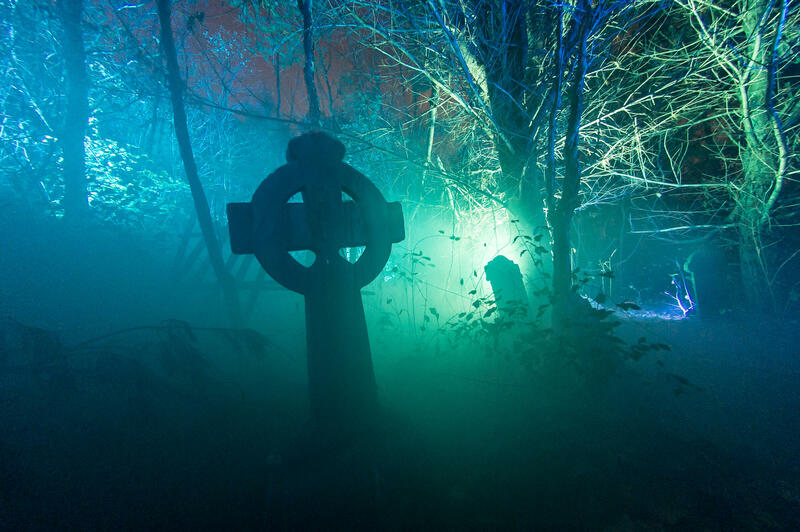 Located deep in the haunted woods and surrounded by rundown fencing, “The Burial Grounds” offers a ghostly experience that no other haunted venue has been able to duplicate. The guide leads an exclusive group of guests through low lying fog, down lantern lit paths to the site of these timeworn tombs. This historic site is authentic. Guests won’t find any foam tombstones at this graveyard. Hysteria’s use of real settings offer guests an experience that is unparalleled by other attractions. Overall, the team at Hysteria does an outstanding job of staying consistent with the theme. Every element reinforces the storyline of the individual attractions. The main characters sell the story and the supporting cast reinforces the feeling that the guest is part of the action. The realism created by the mix of historic, natural and man-made sets is unmatched by indoor attractions. Team Hysteria realizes the importance of always staying fresh. Each offseason, the crew improves upon the existing infrastructure and works hard to bring some of their new ideas and concepts to life. The team always strives to achieve realism. Every aspect of the haunt must be believable in order for the customer to experience true fear. People visit Hysteria to get scared and have an overall great experience. Team Hysteria works hard to make sure that they exceed all expectations. The next time you are in Salem for Halloween, don’t forget to take a drive to Salem Village (Danvers, MA). This IS where it all happened.